The Mekong Delta, otherwise known as the ‘rice bowl’ of Vietnam, is a colourful display of various shades of green. Here in this water world, boats float in the lazy rivers, buffalos wander in the rice fields and ripe fruits adorn the trees. It is also here that visitors will get a true taste of the tranquil Vietnamese countryside. For those of you planning your dream trip to the Mekong Delta, be sure to read our two-day itinerary and discover the best experiences the delta has to offer. Start your trip early at around 7 a.m. This will allow you to have more time to discover these beautiful lands. The best time to visit the Cai Be floating market is at 6 a.m. Wholesalers commute in boats overflowing with fruits, and each boat specialises in a different type of fruit or vegetable. To truly experience the vibe of the Mekong Delta, it is best to take a cruise along the river. The water is abuzz with bustling trading activities, which ironically contrasts the calm life of those locals residing right along the murky banks of the river. The best way to enjoy one of these cruises is with a glass of tasty coconut juice in tow. 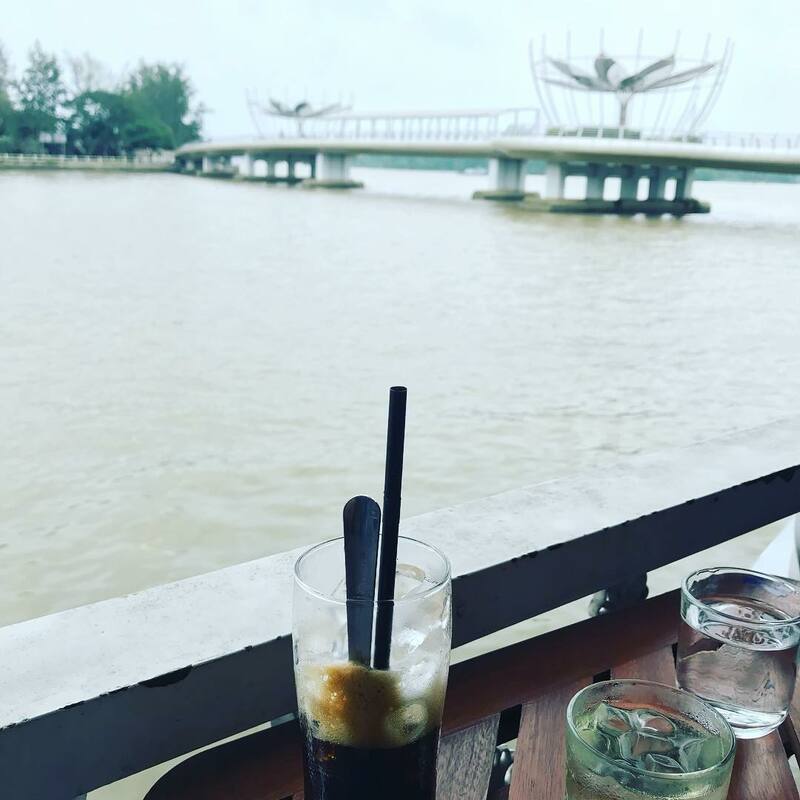 Sit back, people watch and enjoy the breeze along at the Mekong Delta. 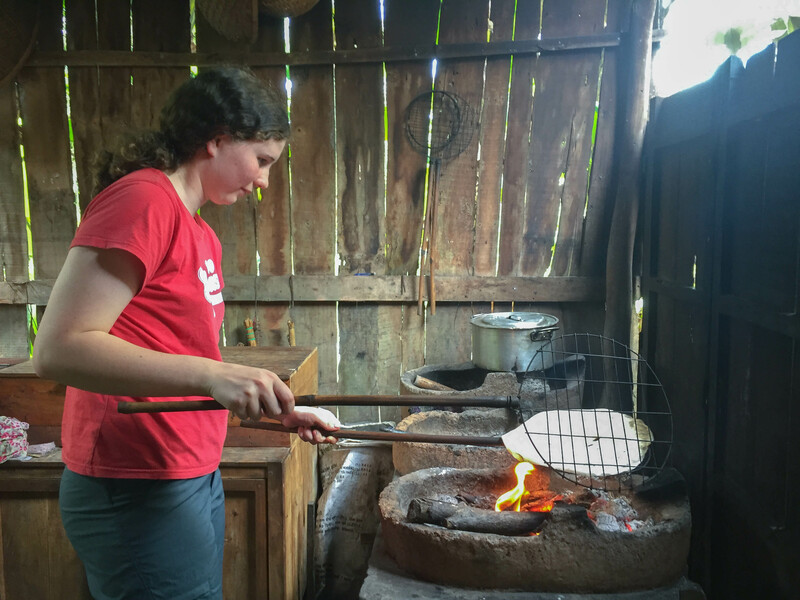 The best part about visiting the Cai Be Commune is being able to learn how to make rice paper and popping rice at a local’s home. This type of snack may look ordinary at first glance, but be careful, as they are undoubtedly delicious and addictive. Tasting one of these snacks after making them yourself is undoubtedly an unforgettable experience and one you will cherish forever. It is an excellent experience for children to partake in, as well. Be sure to end your Cai Be Commune trip by having lunch at a local farmer’s house. Special dishes that are native to the delta are ones made with pork and freshwater fish. If you prefer halal food, be sure to let the locals or your tour guide know so they can prepare your meal accordingly. After taking a short rest, you should then proceed to Can Tho City, which is about a 90-minute drive from Cai Be Commune. Can Tho City is home to some 1.3 million people, and it is the capital city of the Mekong Delta. This is where you should book your accommodation, as well. Check in to your hotel and then visit Ninh Kieu Quay to enjoy charming views of the Mekong River. If you visit in mid-December, you will have the pleasure of enjoying the flower market that is organised here annually. Ninh Kieu Quay is also equipped with many of memorable structures and attractions, including the statue of Uncle Ho, the ancient Can Tho market, the Can Tho floating restaurant (aka a yacht) and much more. Bánh Cóng (Cong cake): This cake is made from glutinous rice flour, wheat flour, shrimp and green beans. Its rich flavour will prove to you why it is the most famous dish in Can Tho City. Bánh Tầm Bì (Tam Bi cake): This cake is a delectable combination of different flavours. It is sweet because of the coconut sauce, savoury from the pork skin, pork meat and fish sauce, pungent from the tasteful, greased onions, mild from the added worm cake, fresh from the cucumber and aromatic from the Vietnamese basil. Read more about Tam Bi cake on Migrationology. Lẩu Bần Phù Sa (Ban hotpot of Phu Sa Resort): This rural hotpot is famous for its seemingly strange taste: a delicious sequence of sweet, sour and a little acrid. End your day by walking around and exploring the nightlife of the city. Remember to put these street food items on your bucket list, as well: Chuối nếp nướng (grilled sticky rice and banana), Ốc nướng tiêu (grilled shellfish with pepper), Chè (sweet soup) and Tàu hủ (tofu). 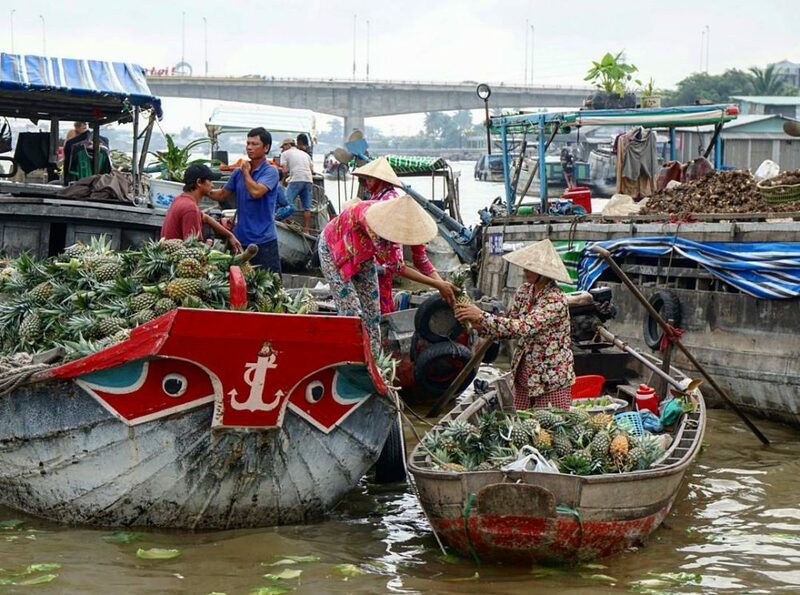 The Cai Rang floating market is the most prominent floating market in the Mekong Delta. It is better to visit the market early in the morning (around 7-8 a.m.) to avoid boatloads of tourists and the heat. This means you should leave your hotel at approximately 6 a.m. When you arrive at the market, there is a bridge that provides visitors with stunning views and is undoubtedly Instagram-worthy. You will then hop on a boat to start your journey of the colourful Cai Rang floating market. 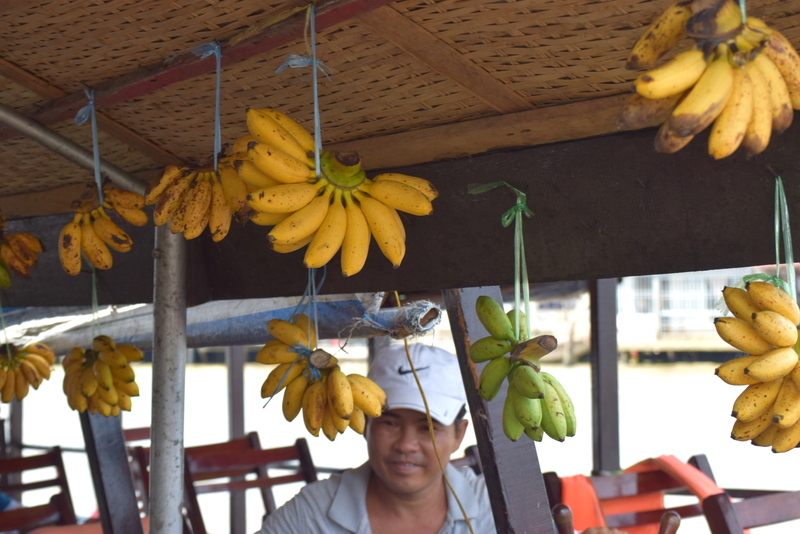 You will see merchants trading fruit and locals enjoying local food like pho, banh mi and pineapple right on the boat as the sun rises. 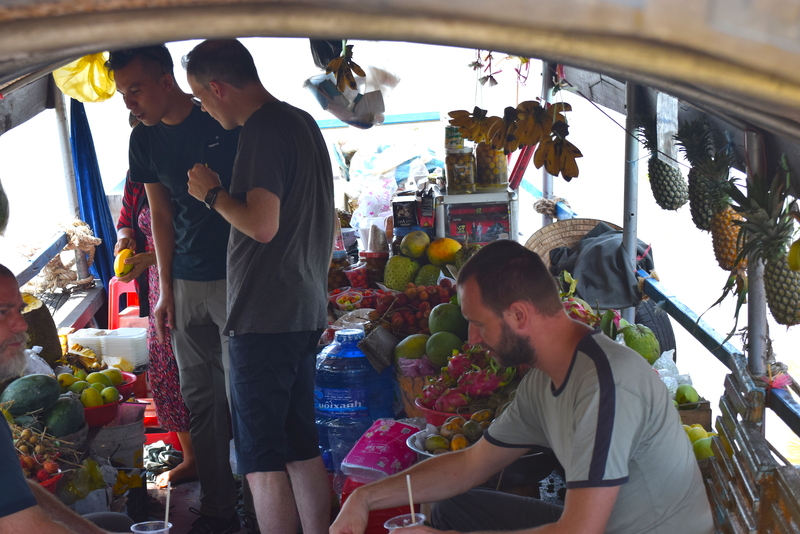 Wholesalers’ boats are full of specialities hailing from Cai Rang Town and nearby areas, including coconut, banana, watermelon, grapefruit, dragon fruit and many more. The market is simply overflowing with hundreds of boats, and locals yell to one another as they sell their produce. Locals hang samples on an upright pole on their boats so that visitors know what it is they are selling, even from a distance. 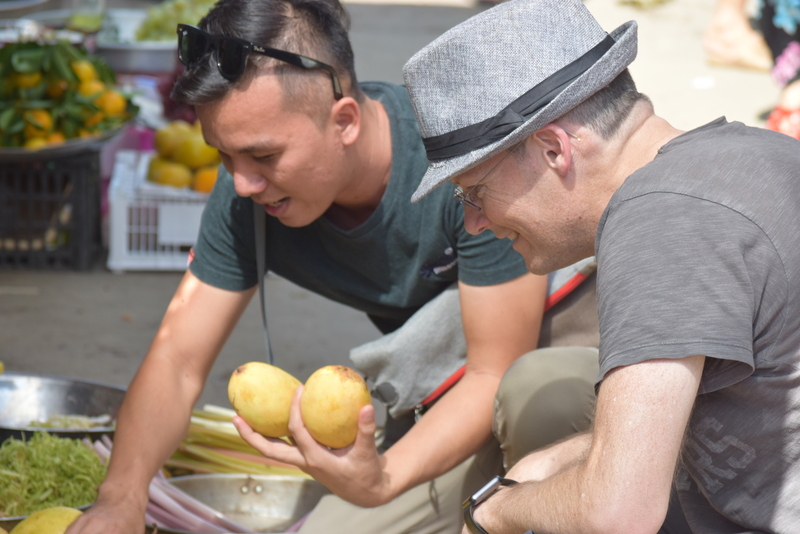 One of the most exciting experiences is purchasing fruit on the river. Visitors can sample the different types of produce from the various sellers before deciding on one to indulge in. The prices vary different depending on the type of chartered boat, so be sure to ask your local insider to know which boat will have the most affordable prices. Stay on the boat and travel to the nearby countryside to learn even more about those residing on the Mekong Delta. 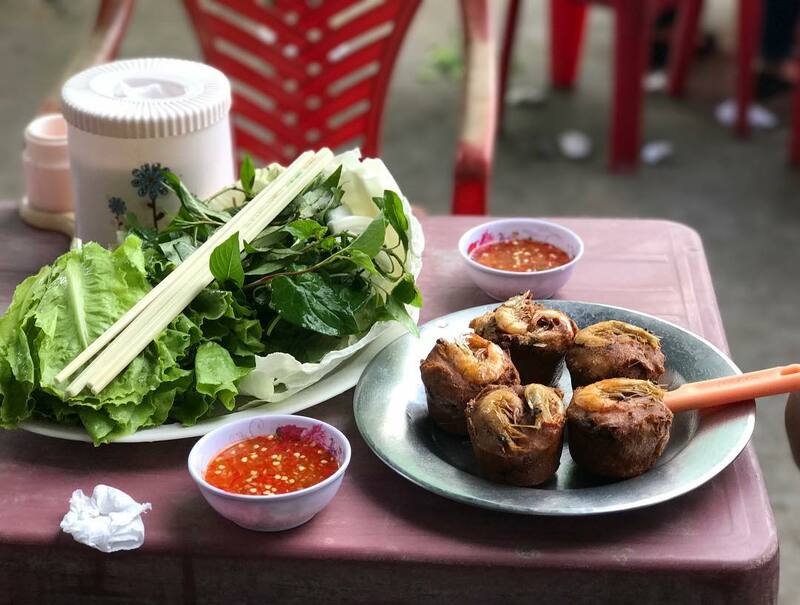 After exploring the area by boat, stop by a local farmer’s house and immerse yourself in the unique Vietnamese culture. Have a quick lunch and enjoy the relaxing way of life here before heading to the next fun activity on our itinerary. 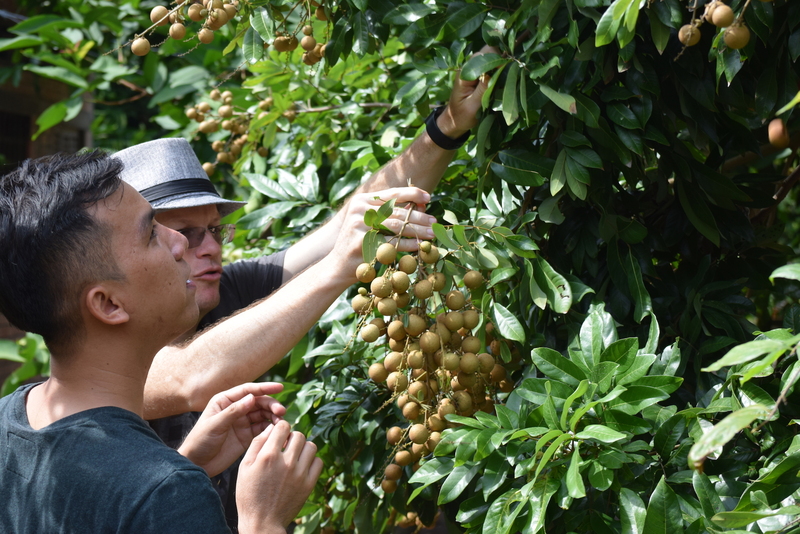 Explore the spacious garden and even try some of the freshly harvested fruits. You can take as much as you want for free, and there are so many delicious fruits to choose from. Be sure to grab enough to bring some back with you to Ho Chi Minh City. Visitors would not believe the price locals sell their fruit to the wholesalers for: it is that cheap! 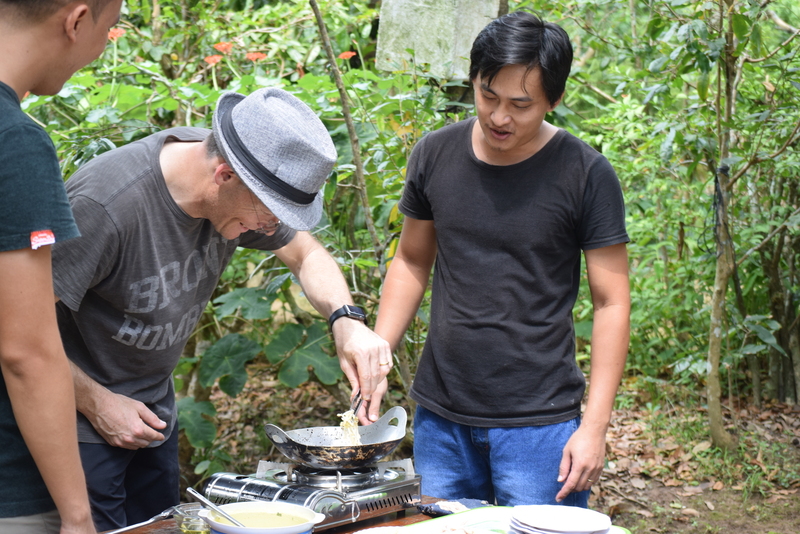 Then, you will learn how to make Xeo cake: a traditional Vietnamese savoury pancake. The cake is made of rice flour, water and turmeric powder and is then stuffed with slivers of fatty pork, shrimp, diced green onion and bean sprouts. Trying a cake you made yourself sounds enticing, doesn’t it? When you are full and have enough energy, it is time to cycle around the village. It is so much fun riding a bicycle in the middle of the scenic rice paddles, and visitors can catch some field crabs and watch farmers as they work their land as they cycle. Stop by a vendor along the way and indulge in a unique glass of sugar-cane juice. The juice is famous in the Mekong Delta, and it is served with salted peanuts, making for a unique taste. 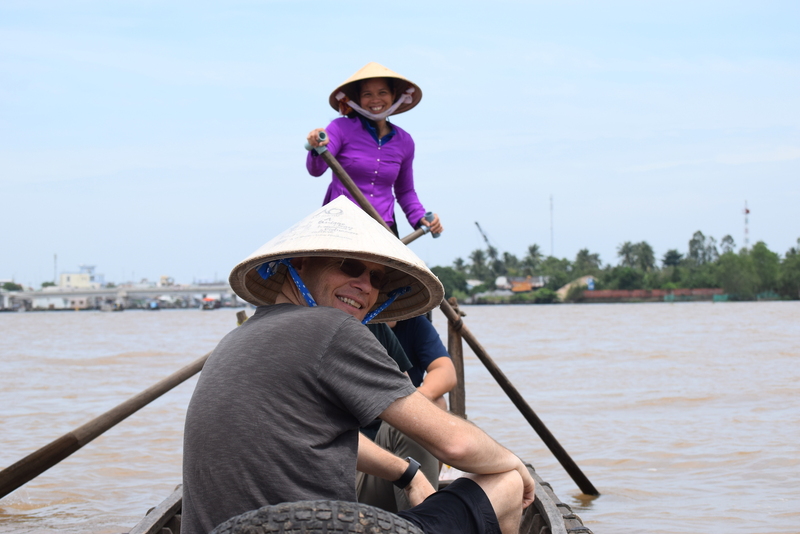 This is the end of your fantastic trip to the Mekong Delta, and it is now time to say goodbye to your local hosts and venture back to Ho Chi Minh City. Are you interested in this private Mekong Delta tour? Be sure to book Xuan as your local tour guide! Xuan was born and grew up in the beautiful Mekong Delta. Xuan will custom tailor everything for you, including your transportation (a private, comfortable van), the food and drinks, entrance tickets into the attractions and even a raincoat if you need it. Xuan will bring you to his local friends’ house so you can immerse yourself in the local life. Now, grab your luggage and get ready for your incredible trip to the Mekong Delta! Where you should travel in Vietnam based on your zodiac sign?